More than ever, clock collectors are fascinated by the microcosm of interacting clock wheels and the combination of engineering and aesthetic design. While such enthusiasts are among the minority at the large timepiece shows, such as Baselworld, they can nonetheless see true fine, mechanical clock making at that show and others. If you count yourself among these clock fanciers, let me point out four clockmakers that continue to practice their art at a high level. 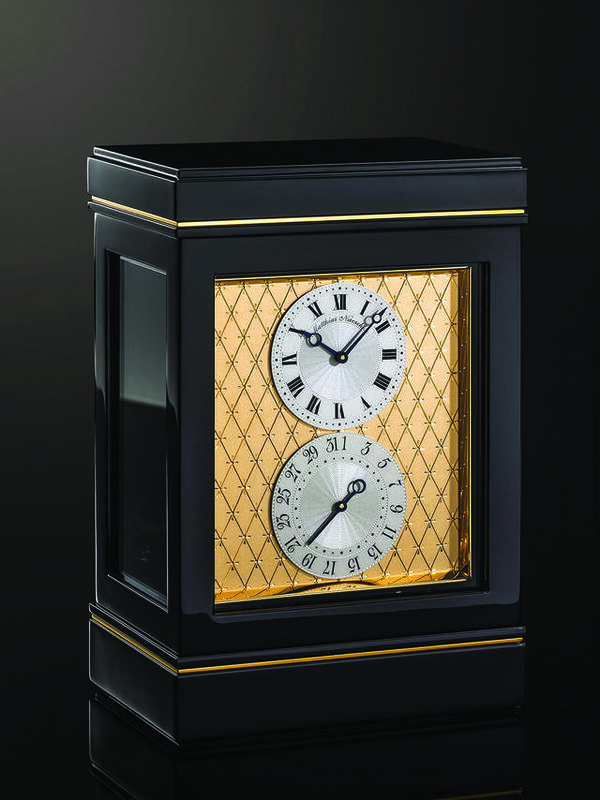 These makers each have a slightly different design emphasis, varying price points and markets, but all offer high quality clocks. Many of the materials, techniques and tools of production have not changed materially in 200 years, and we can note here that today these clocks are still largely hand-made. Of course, for example, there are milling machines for cutting the teeth of the wheels. But, for any function, there always were such tools, perhaps not so accurate and sophisticated but in wide use just the same. And whereas many high-end watches are priced on the basis of what the market can pay, fine clocks are priced on the basis of hours spent patiently at the bench by skilled artisans. When the market for watches wavers the brands can moderate their prices; when the buyers for clocks disappear, the makers are simply lucky to stay in business. These are the stark realities faced by the clockmakers. Yet some makers have survived for quite some time, albeit somewhat tenuously. In 1967 Mike Harding and Bill Sinclair in Cheltenham, England founded Sinclair Harding as a clock repair business. After only a few years Sinclair retired from the business. Mike Harding continued until 1995 when he sold the business to Robert Bray and the company relocated to West Yorkshire. Robert Bray visiting in Qatar to set up an H1 replica clock. Note that between the table legs can be seen the balancing weight which counters the mass of the main mechanism. The whole clock is pivoted at the base of the movement so that it emulates the slow pitch and yaw of a ship, giving it verisimilitude in keeping with its original origins. In 1999 Sinclair Harding started making a 3/4 size representation of John Harrison's H1 Sea Clock – a formidable undertaking. Other specialization milestones along the way include the acquisition of dedicated machinery and skills relevant to the quality of the clocks they produce. In 2014 Bray acquired the firm that had been making their fusee chains and integrated this into clock production. This wonderful addition to Sinclair Harding must make it about the most complete clock making company to be found in the world today. Robert Bray FBHI, proprietor of Sinclair Harding, preparing for the opening of the SalonQP held in the Saatchi Gallery in Chelsea, London, each November. 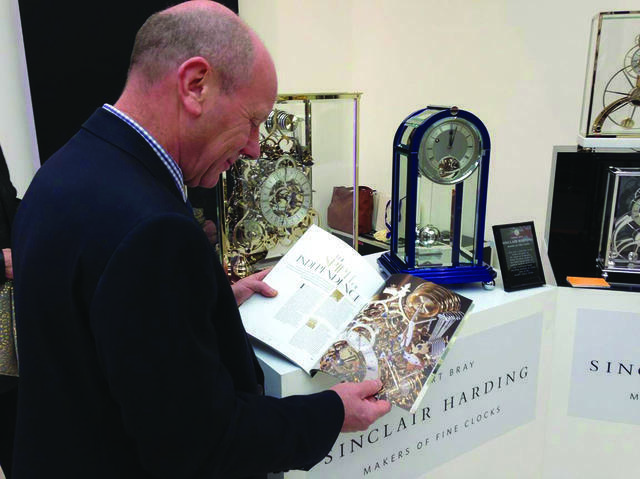 Sinclair Harding exhibits at the AHCI stand. Robert Bray is a Fellow and Vice-President of the British Horological Institute and a member of the internationally prestigious Horological Academy of Independent Creators (AHCI). 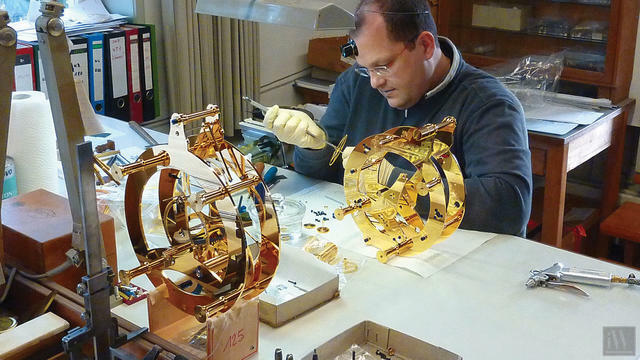 Matthias Naeschke is a highly skilled clockmaker, technical designer and church musician with heart and soul at a level that sets him apart even in the exclusive enclave of high clock making. Naeschke started in 1984 in a small atelier in his private home to build organ clocks. Thus he was the first organist artisan in 150 years to study the art and revive the high craft of the organ-clockmaker. The Matthias Naeschke Cal. 9 offers 14 days of power reserve. Its main plates are made of gilded 2mm brass with 4 pillars, pinions hardened and polished. The Swiss lever platform escapement features a screwed balance. The clock’s dial is hand engraved and engine-turned and is finished with gilding and granular pure silvering, blued steel Breguet hands and a date indication on a separate dial. 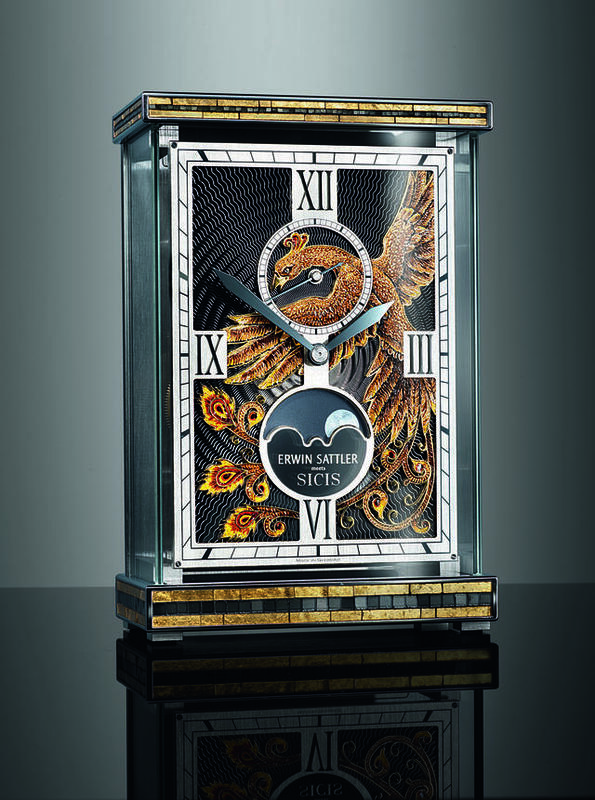 The dial can be set with diamonds and bespoke engravings are invited. The clock measures 24.5cm x 16.5cm x 11cm. This Matthias Naeschke Cal. 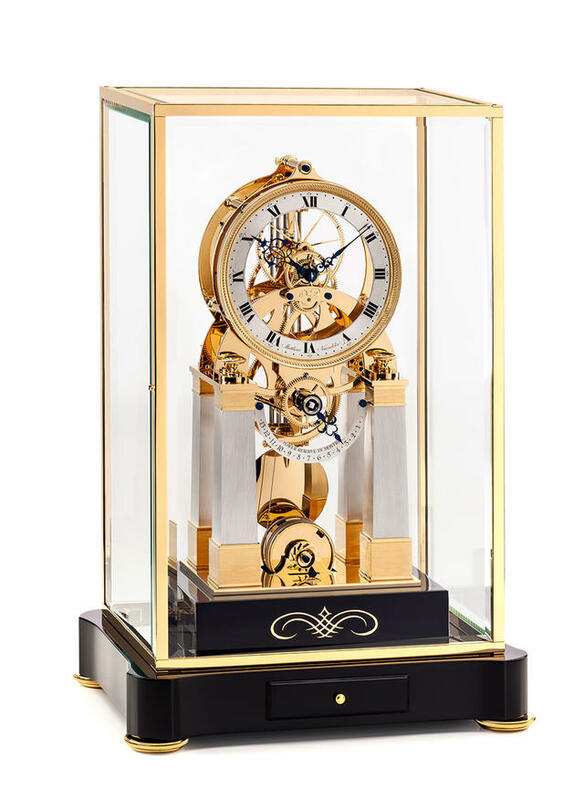 12 table clock features a Matthias Naeschke escapement with compensating pendulum, 8 jewels and 8 ball bearings. Its chapter ring is solid sterling silver with hand engravings, hand-knurled bezel, and separate indication of the power reserve, blued steel hands. The clock measures 63cm x 42cm x 32cm. 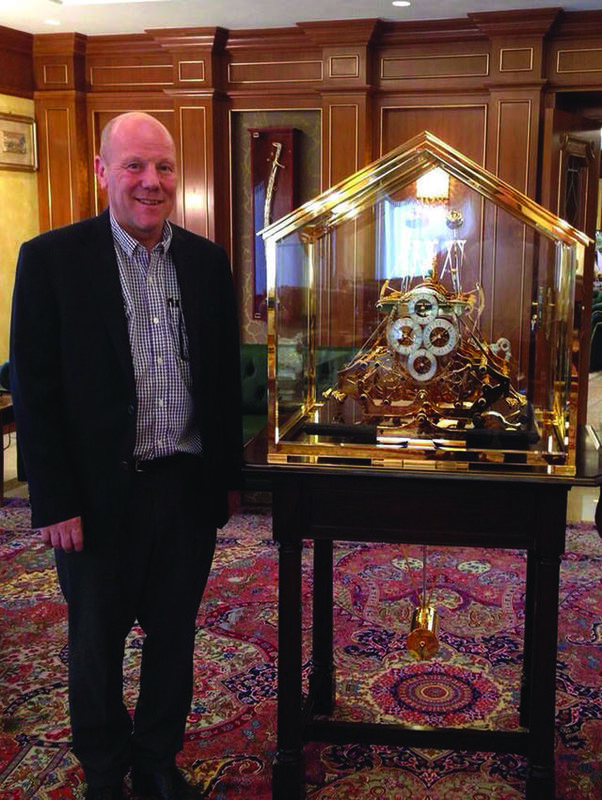 Matthias Naeschke has retired; he has handed on the reins to his clockmaker son Sebastian who is steeped in the industry training and family values of the quality products they make. Set apart from the busy traffic and far away from the hectic bustle of the big cities, Matthias Naeschke's “Haus Rose” workshop is situated high up above the Eyach valley in the small medieval town of Haigerloch in South Germany. Naeschke clock production is miniscule by commercial standards, but this ensures that you are most unlikely to see two identical Naeschke clocks in the same hemisphere. Joseph Kieninger made the first entry in his cashbook on 1st of June, 1912, and only a year later this Black Forest maker already employed eighteen workers. Of his eight children, son Wilhelm’s masterpiece, constructed in 1930 at the clock maker school in Schwenningen, became the cornerstone for the current H-series, the lead product of the house and the design still produced today. The invention of this movement for grandfather clocks made Kieninger the specialist for movements with quarter chime. New from Kieninger is Cal. RS012 – set in an extravagant clock case in satin black piano finish with back panel in striking light ebony veneer, polished stainless steel inlays around case and in back panel, 3-train cable movement with original German cathedral strike, maintaining power, automatic night time ‘silent’ between 10.00pm and 7.15am and classic silver plated regulator dial, special second pendulum with carbon fibre rod and precision adjustment. Numbered edition. The company got into some financial difficulties in 1990 and the Kieninger Company was sold to the American company Howard Miller at the end of 1993. This family-owned company from Zeeland, Michigan, is the world’s biggest clock manufacturer and has a high demand of clock movements itself. All Howard Miller mechanical floor clocks, as a result of the purchase, use quality Kieninger movements made in the Black Forest region of Germany. Today Kieninger itself presents the full scope of its clock movement technology and a style spectrum that offers classic to contemporary design in a worldwide collection of floor, wall and table clocks. In 1958 Erwin Sattler founded his Bavarian clock manufacture, which bears his name today. He attached great importance to pursuing timeless design. The company has developed into a modern-day clockmaking manufacturer that combines state-of-the-art technologies and centuries-old traditional craftsmanship. Most of its clock parts are now manufactured in-house in small-batch series, allowing creative opportunities for buyer’s customization. For nearly sixty years, Erwin Sattler has been delivering the highest standards of quality and has been developing and making timepieces of lasting quality. In the mid 1980s his daughter, Stephanie Sattler-Rick, assumed financial control, and more recently clockmaker Richard Müller joined the management as technical manager. The pair now co-owns the firm as in 2002 Erwin Sattler retired. Today, the precision clocks of the Erwin Sattler factory, produced in small batches, are reckoned as among the best in the world. We should do our best to support these rare clockmaking companies as the current global instability is not helpful to these exclusive artisans. Quiet stable markets provide the lifeblood of these centuries old traditional mechanical arts.